North Dakota Agriculture College (NDAC) was established in 1890, by a law that allowed for an agriculture college to be formed in Fargo, North Dakota . This was part of the United States government’s effort to create colleges for the study of agriculture and the sciences. The following appeared in the Daily Argus on May 2, 1890: “At the meeting of the Fargo Agricultural College board yesterday afternoon the following members were present: J. B. Power of Power, E. M. Upson of Commings, M. Saunderson of Edgely, and O.W. Fancis of Fargo. Mr. Francis was elected president and J. B. Power, secretary. After organization the situation was discussed and steps taken to obtain for the college the $15,000 to be given by the government for an experiment station. The board adjourned until the fifteenth.” When the fifteenth rolled around, the board set up an experiment station that would reveal whether or not this new college would work out. The North Dakota State Legislature set up the rules and regulations for the maintanance and running of the college in the first and second session of the assembly. The Daily Argus reported on May 16, 1890 that “Forty acres on the Lowell farm, one half mile south of the city, have been secured. Buildings will be secured in the city;” which meant that now the college had a place and buildings in which to meet and hold classes . These buildings were not made for the college, but were existing buildings that were used in case the college failed. 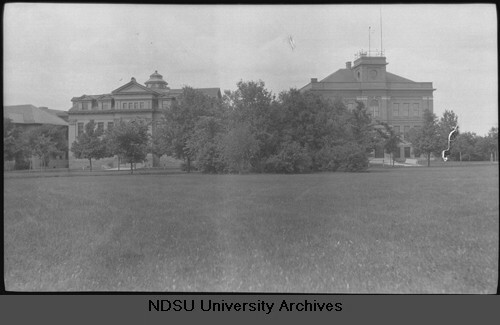 The first building specifically built for NDAC, is the building now known as Old Main . At the time of its construction, this building was known as College Hall . Construction on Old Main started in 1891 and was completed in 1892, shortly followed by the “Farm House,” Francis Hall, and the Mechanic Hall in 1893, the Creamery in 1895, and the Festival Hall in 1897 . Old Main held classes, offices and laboratories for the faculty, a library, a gym, an office for the president, and room for an enrollment of 80. The first staff member hired by the school board was Clare B. Waldron, who was a botanist. He arrived in July 1890, and he was the only staff member around for the next three months. On October 15, 1890, the first budget was approved, the president, Horace E. Stockbridge, was hired, and the first three faculty members, Henry L. Bolley, Edwin F. Ladd, and Clare B. Waldron, were hired by the school board . The first regular classes were not held until September 8, 1891 . The students had unofficially called NDAC North Dakota State University right from the beginning, when NDAC was just an experimental school, but the name was not changed until December 8, 1950, because there were not enough votes to officially change the name of the college until 1950 . 1 NDSU Archives, Law Passed at the 1st Session of the Legislative Assembly of North Dakota. 2 NDSU Archives, Daily Argus. 3 NDSU Archives, Daily Argus.